The Laurell H6-8 spin coater is compact, packed with advanced features, and designed to the be the easiest spin coater to install in your glove box. This 650-series HL coater system will accommodate up to ø200mm wafers and 7" × 7" (178mm × 178mm) substrates, and features a maximum rotational speed of 12,000 RPM (based on a ø100mm silicon wafer). Liners: Removable, reusable process chamber liners, made from FEP Teflon®, are available for every model, and one is included with every HL Series Spin Coater. 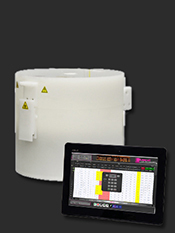 All HL Series systems include a wireless tablet featuring the exclusive Laurell Touch process control software. Researchers worldwide have developed unique processes which will ONLY run with the level of control sophistication we offer. The HL Series controller can also be used in conjunction with a PC with Spin 3000, Laurell's exclusive process management software. However, this is NOT required to program or run the equipment. The use of a PC adds the ability to record a process as it's run, operate remotely, program or communicate across a LAN or the Internet. The software, which is supplied at no additional cost, allows the operator to create virtual process simulations even beyond the hardware actually installed spin processor, in effect, letting them try it before they commit to a process. All HL Series systems can be upgraded or re-purposed without return to the factory with simple plug-in modules, either actually or virtually, and can contain a virtually unlimited number of processes and steps. A Brief Description: The housing for this system is typically made from a solid co-polymer blend exclusive to Laurell Technologies. Unlike pure Natural Polypropylene, this material is able to resist solvents and strong acids and bases. Samples are available for testing and verification upon request. A solid PTFE Hostaflon® TFM-1600 / Teflon® AF housing is available (popular for high temperature chemistry and sub-micron particle studies). Laurell's unique internal bowl design eliminates splash back, making it unnecessary to install "splash rings." Our Exhausted Drain Adapter with removable reservoir is as functional as it is convenient. The closed bowl design, coupled with the precision of the process controller, allows most coating materials to dry in a quiescent state, increasing uniformity and minimizing particle contamination. The upper plenum closes inside the base to provide an overlapping seal, and the inside of the lid has a special gutter to channel fluid to the rear of the system to discourage chemicals from accidentally dripping onto the substrate. A proprietary labyrinth seal protects the motor and control electronics from chemical contamination. This seal provides the process chamber with Nitrogen purge and has been proven to be particle-free on a sub-micron level during field testing. The system's clear top is made from ECTFE (unless otherwise stated), and only ECTFE-coated 316 stainless steel screws are used in some non-wetted areas throughout the system. For more information, see HL Series Spin Coater. Complete electrical isolation from the operator, fool-proof door interlock, and ETL certification, UL, and CSA approval of components assure many years of safe, trouble-free performance. Interlocks prevent rotation when the vacuum switch has not been engaged and when the lid is open. All Laurell systems are CE and RoHS compliant, and all certificates are sent with each system. For more information, please visit the Safety page. The "process safeguard" feature of all Laurell process controllers ensures that the same process cannot inadvertently be run on the same substrate. This feature can easily be bypassed to run the same process again without opening the system or a sequence can be run over and over (looping). N2 Process/Seal Purge: 60–70 PSIG (4–5 bar) of Nitrogen/CDA is required to pressurize the labyrinth-type motor seal. This gas also purges the process chamber. The gas consumption is very low, at 3 cubic feet per hour (0.085 m3/hour). 10 feet (300 cm) of 3/16 inch (~4 mm) inside diameter X 1/4 inch (~6 mm) outside diameter PE tubing is provided. Vacuum: 25–28 inches (~635–711mm) Hg of vacuum with a flow volume of 4.5 SCFM (0.127 cubic meters/minute) at 0 inches Hg is suggested. 10 feet (300 cm) of 3/8 inch (~9.5 mm) outside diameter X 1/4 inch (~6 mm) inside diameter PE tubing is provided. The HL Series is typically employed in glove boxes for Solvent, Base or Acid-based processing: Coating, Etching, Developing, Rinsing-Drying and Cleaning. While all of these process are supported, Laurell recommends single-use only, due to known material conflicts. For example, Photoresist and Developer (cross-contamination), and SC-1 & SC-2 (HCl + NH4OH), creating NH4Cl, a hazardous inhalation risk. Many dispense options, both manual and automatic, are available. "We bought a spin coater from you company two mounts ago [sic]. We use it allot and it is very good especially with [IV-PVG]. It is really good, better then vacuum pump. So thanks for good advice. " "Everyone loves it [customer received a Laurell WS-650Mz-8NPPB system] and comment[s] on how smooth it runs compared with the previous ones we had. Overall I consider it an excellent purchase and I would recommend this model to anyone in the market for a spin coater." "I've used your spin-coater since 2000. I love your equipment." "Thank you! Your services and follow-ups were extraordinary. I wish that every company would have that attitude." "The quality of the outcome is just perfect!" "Thanks for the speedy delivery. I didn't even know purchasing had processed our order and assigned a budget yet!" "We are really happy with your spin coater... The spin coater has performed exactly as we hoped."